Blends with : bergamot, sandalwood, rose and all citrus oils. Constituents : benzyl acetate, linalool, indole, benzyl alcohol, benzyl benzoate, geraniol, cis-jasmone, methyl, anthranilate. It also has trace amounts of farnesol, p. Cresol, cis-3-hexenyl benzoate, nerol, eugenol, ceosol, benzaldehyde, benzoic acid, y-terpineol, isohytol, nerolidol, phytol. 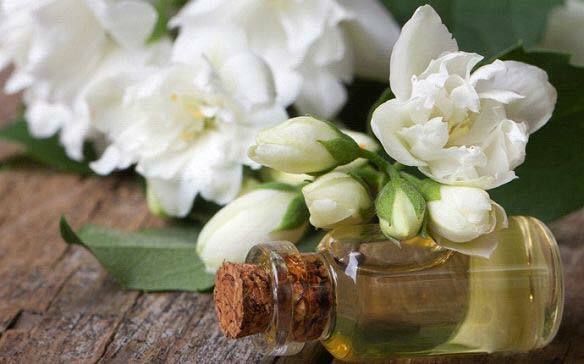 Benefits of jasmine essential oils - jasmine essential oil can tones the uterus and protects it from tumors, regulates period cycles, eliminates fat cracks & scar marks, provides relief from cough and prevents wounds from becoming septic. Solubility - insoluble in water, soluble in alcohol and oils. Extraction method - hydro - distillation of jasmine flower. Uses : jasmine oil helps in toning up of the body as well as takes care of the dry, greasy, irritated & sensitive skin. It also helps in increasing skin elasticity and is often used to assist with stretch marks and reduce scarring.